Buying a home is a big deal. Not only is it an investment, but it is also a place where you and your loved ones will make memories together. So, you want to move forward in your home purchase with all the information and confidence you can. But many potential homeowners wonder if a home inspection is really necessary. Here’s what you can expect from a HouseMaster home inspection. A home inspection is not a pass/fail test. 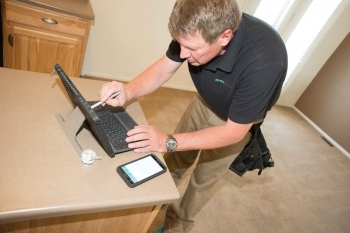 A home inspection allows you to know the true condition of the home to take into consideration before you purchase. In competitive markets like Colorado, many buyers are hoping to get a to-do list of potential home defects to use in price negotiations with the seller. This isn’t our goal. My team of qualified home inspectors is here to help homebuyers fully understand the current condition of the house and what additional costs could be on the horizon in the next few years. A home inspection is all about education and understanding. A thorough home inspection should take between two to three hours. When we arrive, our first step will be to fly our drone over your roof and inspect it for potential issues. Using emerging technologies like drone video and photography gives us an up close and personal view of every inch of your roof without the time and hassle. And it eliminates any potential to cause damage by walking on the roofing surface. Next, we’ll work our way around the entire home site — the grading, the siding, the exterior windows and doors, the driveway, even the landscaping — to look for signs of any conditions that could cause problems in the future. In the garage, we’ll examine the home’s electrical wiring. Our inspectors will inspect the wiring system to see if it is set up correctly and that the proper sized wires are installed for optimum safety. As we work our way into the interior of the house, we’ll inspect the furnace and air conditioning, the water heater, and all other major utilities. In the kitchen, we’ll check appliance serial numbers and ages and make sure they are operating correctly. Throughout the home, we’ll systematically test lights and switches, windows and walls, and in general, try to find anything that has been missed during initial viewings. In addition to our meticulous inspection, you will also receive the full range of HouseMaster services. At the end of your inspection, will provide you with our Inspection Resource Guide filled with tools to help you understand the next steps you should take and interpret findings in your personalized Computer Generated Express Inspection Report. As home inspectors, we love when the buyer follows along with us through the process and asks questions. After all, this is YOUR inspection. There are no stupid questions, so ask away. Our primary purpose is to teach you about your future home. For many buyers, we often go into detail on how to maintain your new home and properly run the various home systems, from the furnace to the electrical circuit board to the fireplace to the plumbing. We’ll go over potential issues we may see and explain what the process may be to remedy it. When your inspection is over, we hope you walk away feeling confident in your knowledge of your future home. If you feel prepared and educated, then we’ve done our job. Before you sign on the dotted line, let us help you have a full understanding of your future home. Schedule your inspection today (it takes less than a minute to schedule! ), and we’ll be in touch.